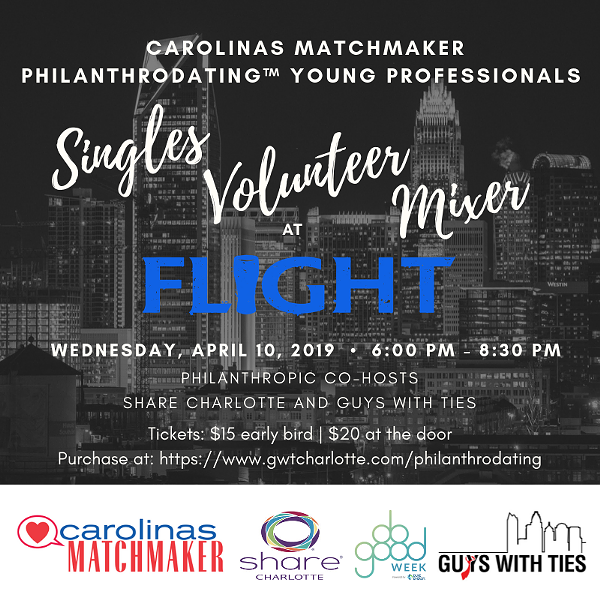 Join Carolinas Matchmaker Laurie Berzack and philanthropic co-hosts SHARE Charlotte and Guys with Ties for an exciting Philanthrodating™ Young Professionals Singles Mixer at Flight Beer and Music Hall on Wednesday, April 10, 2019, from 6 PM – 8:30 PM. Come out to mingle and enjoy the company of new people in a fun and relaxed atmosphere while volunteering on site for some great causes in celebration of SHARE Charlotte’s “DO GOOD Week”. Light refreshments will be provided with a cash bar available. Proceeds from this mixer will benefit American Pit Bull Foundation and Joedance Film Festival.